Matti Friedman of the Associated Press published news about a recent excavation in the City of David in Jerusalem, near the Gihon Spring. 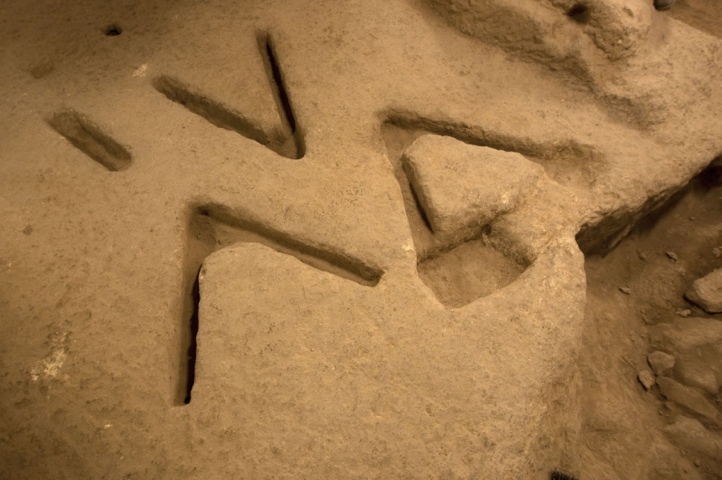 The excavation revealed an interesting set of markings carved into the stone floor of a room, and expert archeologists cannot determine what their meaning or use was. 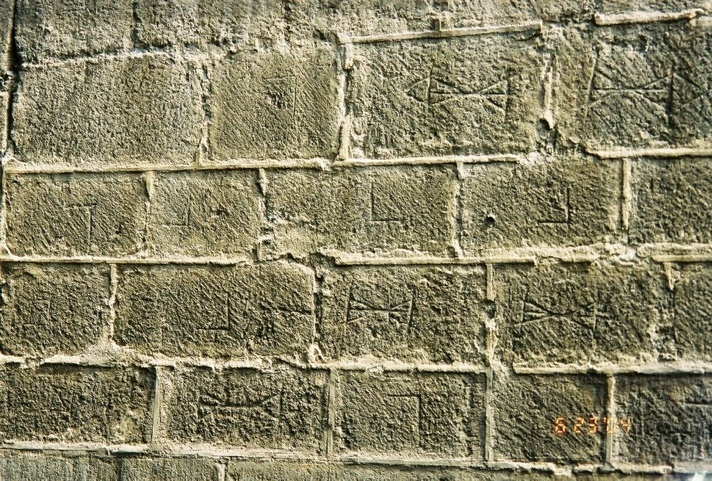 The markings consist of three “V” marks, or perhaps gammadia “Γ,” although one is inverted from the other two, plus a straight line mark. They date to about 800 B.C. It’ll be interesting to see what they discover further about these strange markings. They remind me of some similar stone markings I saw a few years ago that date from a completely different time and place, found on the exterior wall of a very old church in Toledo, Spain. I took a picture, below. Interesting article. Nice to hear scientists admitting that they don’t know all the answers. To presume that we understand everything about the “ancients” is a bit arrogant. Lets hold off on hasty conclusions until all the reports are in. These markings make me say ‘hmmm’ Very interesting. Your personal photo is also very interesting. Thanks for posting. I saw this article on Yahoo about the markings about a week ago and I thought…..that looks interesting. That said, whatever the message is, must have been important at the time – I can’t imagine carving stone was for the faint-hearted. I hope they figure it out. I think it was to set something in to keep it secure. It had a different kind of base but that’s what I think. Something fit into it and they did not want it to slide around the room.. Grooves to keep something from sliding? Sorry, but there are MUCH more practical ways to do that–notch, notch, notch, done. And besides, this it STONE. Just stick another stone on top of it and it isn’t going anywhere. No, those marks had a much more specific use. In that room. Near a spring. So that water could be re-directed there when necessary. Actually, Eric, this was probably built by stone cutters — notches like this would have not been an issue. And the “hold something secure” thought is the first thing that popped into my head as well. They’re not letters with a meaning, I think, they are slots where the base of something fit into, with additional slots for other things as well. I’d think the depth and such might be an indication of the value of the “something” being held in place, but that’s just my imagination. BTW, there are explanations for the room, just not things that “scientists” would keep up with. “expert archeologists cannot determine what their meaning or use was” “Such stones were used in the ancient Middle East as a focal point for ritual or a memorial for dead ancestors, the archaeologists say…”. Who are these archeologists? Where do we find other such marking by archeologists that are used for “hold something secure”. There deep to hold oil and water? Well it could be that that whatever the notches were suppose to hold has just as much meaning as the marks themselves. Those are pretty specific notches if you ask me. But whatever it is suppose to hold has been lost to history and science. Josephus cites eye-witness accounts of people like Aristeas and Polyhistor, who said there was a spring under the temple. Many of the Psalms refer to this water source. Since the Gihon Spring is the only spring in Jerusalem, since it was located in the middle of the City of David, and since the temple was built in the middle of the City of David (not north of it as is currently thought–the so-called “temple mount” is actually Fort Antonia) these discoveries could be related to the means of getting the water up to the temple, to the water wheel, which was located in an inner inclosure. My guess is these are molds that hot liquid metal was poured into. I think these are for metal tools, probably for stone carving. If you were to hold one of these V-shaped tools at one end, you would have a very effective hammer-like tool for roughing out stone shapes, as it provides extra leverage and force. These poured metal objects would have been pounded into their final form after being extracted from the mold. However, I also like the “notches” are for holding something in place.